Thyroiditis includes a variety of thyroid conditions. Conditions that affect your thyroid can cause an increase or decrease in the amount of hormones this gland produces. 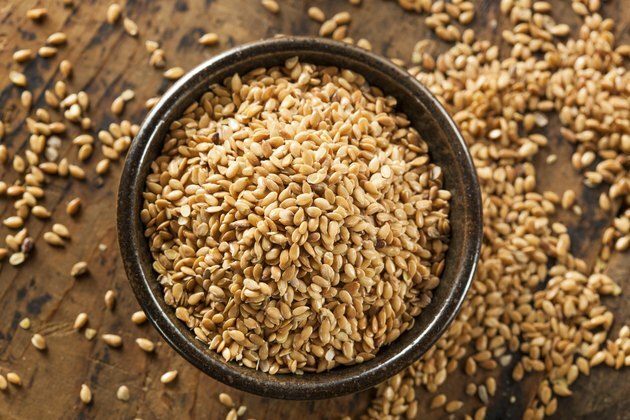 Flax seed may play a role in the health of your thyroid gland, although you should always talk to your doctor before using a nutritional supplement or herbal product to treat a medical condition. Hyperthyroidism occurs when your thyroid produces an excessive amount of hormones, leading to an increase in your metabolism. This condition is most common in women between the ages of 20 and 40, although men may also experience hyperthyroidism. Symptoms of this disorder include an increase in perspiration, shortness of breath, palpitations and insomnia. Hyperthyroidism generally occurs in response to an autoimmune condition or tumor growth. Hypothyroidism refers to insufficient amounts of thyroid hormones. Underactive thyroid is another term for this condition. Hypothyroidism affects people of all ages, but occurs more often in women over the age of 50. The reduction in hormones leads to a decrease in your body's rate of metabolism. Symptoms that accompany this condition include fatigue, weight gain, sensitivity to cold, slow pulse, headaches and depression. Hypothyroidism has various causes, including an iodine deficiency, although this is rare in developed countries. Flax seed is a rich source of essential fatty acids, especially in the form of omega-3 fatty acids. The University of Maryland Medical Center recommends that people with thyroiditis consume between 1,000 mg and 1,500 mg of fatty acids per day. These fatty acids help to promote healthy hormone production and act as anti-inflammatory agents, although more research is necessary regarding the possible risks and benefits of consuming flax seed. Consult your doctor if you experience symptoms of hyperthyroidism or hypothyroidism. These are both medical conditions that require proper diagnosis and treatment. Flax seed is not a standard remedy for thyroid problems. Although most people can safely consume flax seed, this plant product may increase symptoms of mania in people who suffer from bipolar disorder. Flax seed may have a laxative effect, leading to bouts of diarrhea or other digestive disorders. The omega-3 fatty acids in flax seed can thin your blood, increasing the risk of excessive bleeding in people who take blood thinners. What Are the Causes of Fluctuating Thyroid Levels?